It's not that I didn't like Broadchurch. It was engaging, had a fantastic setting and the performances were great. That said, I didn't feel as though it achieved its full potential as a crime series and was in some ways compromised by its desire to achieve the widest possible audience. I'll do my best to articulate this while remaining spoiler free. I paid for an iTunes subscription to season one but I only got around to watching the first season when it was available in its entirety. This resulted in my watching the entire thing in a mad glut, covering all eight episodes in the space of a week. While a viewing frenzy is absolutely my preferred way of watching a series, it does bring with it a heightened awareness of the narrative flow. With no intervening weeks to break up each episode I may be a bit more critical than had I had to wait week to week. That said, I do think a series should hold up uninterrupted. 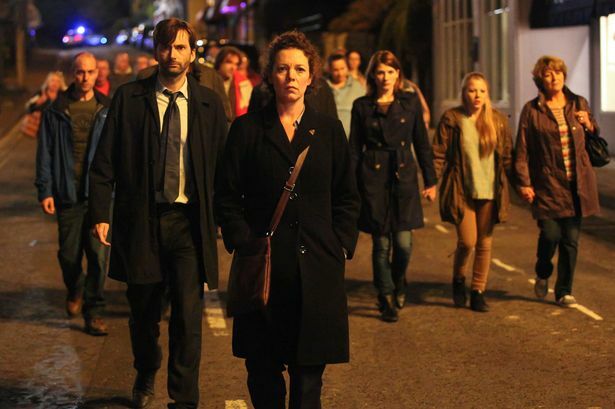 Broadchurch both cleverly and frustratingly covered a wide base. It was just gritty enough to appeal to viewers of darker crime shows like Luther, Wire In The Blood and Prime Suspect while retaining a degree of cosy and unthreatening small town series like Inspector Morse and Midsomer Murders. While this broad appeal was very successful making the series a hit it did feel as though it was pulling its punches, and ultimately suffered for it as a result. Although described as 'the British The Killing' the series lacked the hard, emotional edge of its Danish cousin. It was also missing a degree of complexity relying only its exploration of the story of the family of the victim (very The Killing) to fill out what was ultimately a fairly standard whodunnit. A second plot line, the time spent early on a possible second thread about journalists, never really bares fruit. Had the media frenzy around the murder been done properly it would have made the primary events of the police investigation feel more pressing, more urgent. These central criticism aside, there were many excellent flourishes throughout the series. The deliberate juxtaposition of the bright, sea-side town as the setting for a dark(ish) crime story was ripe with possibility and well exploited. So too was the central tension between the two police detectives — the grizzled outsider who steals the promotion of the chirpy local cop. All great stuff and good pointers on how to re-mix the familiar into an interesting crime story. Despite its flaws Broadchurch is watchable, and perhaps even more interesting as a lesson in what to do and what not to do in making a crime story feel fresh and exciting. Thoughtful comments. I come from outside the genre's usual audience and found Broadchurch to be thoroughly engaging viewed en masse. Having seen none of the series you compare it with I did miss where it reused ideas and skipped expected beats. There were astonishing character moments, Mum in the supermarket for example, or the newsagent's story, that were exquisitely conceived and delivered. The story's trepidation around showing the grit expected of the genre was calculated, no doubt, but was successful - the show captured fans of great TV as well as great crime fiction and should be used as your "try this" offering when converting friends into fellow fans. Excellent points. I guess the broad approach does allow for a greater viewership that might otherwise avoid crime series. My focus in this 'review' is very much on the narrative issues so I'm glad you've picked up on the character moments as there are some tremendous, very nuanced performances.